Here is a long article here about a new community in Olympia Washington. 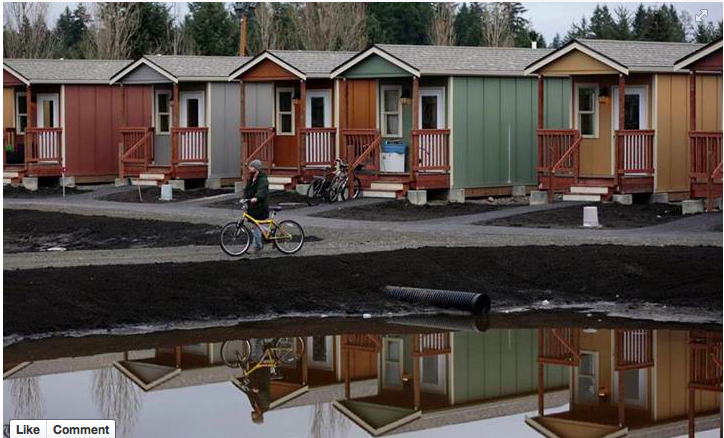 It consists of 29 tiny houses for the homeless. It is well written and covers a good deal of the background detail. I think, what they are doing here is great, and thought you might also want to read about it. I hope that they have left each of the inhabitants a place to grow a little garden. I also hope that many communities use this as an example and set up similar sites. I have only two suggestions. One is that they put in flooring, or even paint the plywood because it is not easy to keep raw plywood clean. The other is that the build supplemental stairs since it does not look safe or easy to reach the bottom stair on these houses. On the topic of handouts, yesterday I saw a video which pointed out some very interesting points. I know it looks rather boring, but it isn’t. Contrary to the way it looks it is one of the most interesting videos I have seen on the topic of poverty. It also offers fresh perspective on hand-outs. Today, I am in Hamilton. 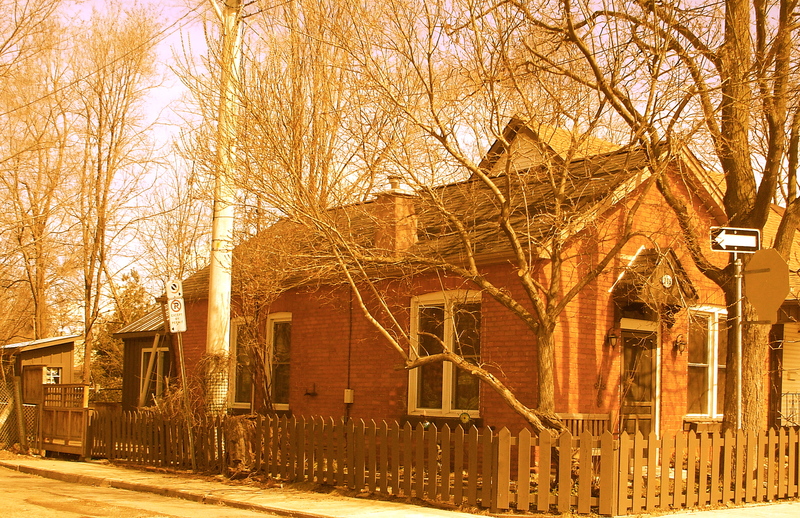 While here, I took a few minutes to stop at a couple of the wonderful old tiny houses that are part of the Hamilton Ontario, neighbourhood: Kirkendall North. I left cards at couple of particularly charming ones to see if they would be interested in allowing me to tell the story of what it is like to live in these houses and a little about the history if known. If the owners will meet with me, then I will do features about them on Tiny House Listings. The houses I selected are all about a century old and appear to be between 3 and 5 hundred square feet in size. I really hope to hear from the owners, not just so I can meet the Tiny Housers… but also because it would be fun to share some new stuff about old tiny houses with you, and to learn about them myself. The great news is, one of the houses had someone at home… and surprisingly, I was invited in. I have secured a time to come back to do an interview and take some photos. It is a charming place which if I am well organized you will learn about next week! Are you all as excited as me??? Here is a little info and some wonderful photos from the Kirkendall neighbourhood that might give you some idea of what is coming your way. Below is an obscured photo of one of the houses that interests me. I am not sure if this review is interesting to my readers as well, but I thought perhaps you might want to know that there are lots of people out there who love Tiny Houses as much as you do! The movement is growing. I hope that 2013 is the year that all those who are dreaming about a Tiny House of their own are able to get it started. Thank you very much for reading this blog! I had no idea that SO MANY writers do their work in Tiny Houses! I find that writing at THO goes well, I suppose it is connected to the lack of distraction but I also think that there is a safe coziness that contributes to my ability to release what I want to say. I have to say that I am most surprised by Virginia Woolf’s Tiny House. How nice that she finally did get not just a room of her own but a whole Tiny House! Do you recognize any of these or know of any more? Each photo is labelled by the writer who used or uses it.